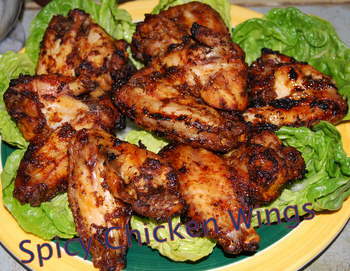 Don't you just love a good Chicken wings Recipe? The only thing is that there's a lot of skin involved and a lot of fat stored around the wing area. and losing most of the unhealthy fat. We call it the Oven Barbeque......and all you do is marinate your chicken wings in our special Mediterranean spicy marinade and then cook them on a rack over a roasting tray half full of water. All the fat drops into the water, leaving you with Crispy, Spicy, Delicious and Healthy Chicken Wings. Just follow the easy step-by-step instructions below for a great taste experience. A perfect recipe for your Mediterranean Diet. 8 Large chicken wings (trimmed). A 1"/2.5cm piece of fresh ginger (grated). 2 Large cloves of garlic (mashed to a paste with a little salt). 2 Teaspoons of cumin seeds (comino). A 2"/5cm stick of cinnamon. 1 Teaspoon of black peppercorns. 2 Tablespoons of extra virgen olive oil. 1/. First dry roast the cumin seeds, cinnamon, black peppercorns and chillies in a pan and grind them together in a pestle and mortar. 2/. Place the spices and all the other marinade ingredients in a large glass bowl, mix well an add the chicken wings, coating them well all over with the marinade. 3/. Leave them to marinate for at least an hour (two or three would be even better). 4/. Now - Arange the chicken on a rack over a roasting tray of water (see photo). 5/. Roast at 180ºc/370ºf for 45 minutes - turning once. 6/. While they are cooking you can top up the water in the tray as it evaporates. Et Voila! Spicy Mediterranean Wings. You don't even have to lose any of the goodness in the tray below - if you want a sauce, just skim off the fat and use the juices. Put them into a pan, bring to the boil and reduce by half.... check the seasoning and thicken with cornflour/cornstarch if desired.